Happy Fri-Yay friends! And Good Friday! This week has been a bit stressful. But when I remember what occurred today, it's also been pretty humbling. I'm thankful for many reasons that today is Good Friday and not because it's the start to the weekend! I think this might be one of my favorite outfits ever. Probably just because Em is an amazing photographer. And this was a new spot for me. But there's something about this outfit that makes me feel very Parisian Chic. Have you guys tried Rocksbox yet? It's this amazing service, where you can essentially "rent" over $200 worth of jewelry for just $19 a month. You can send back the box at any time, adn they send you new one. Imagine getting new jewelry once a week. How amazing is that? And if you enter my special code NIKKIxoxo1, you can get your first month for free!!! That's awesome, right? I keep getting fab pieces like Kendra Scott, Gorjana and House of Harlow. I am fully obsessed! You should try it out - what do you have to lose? Nothing looks better than a black and white color combo. I agree with you, it is so parisian chic. Beautiful look Nikki, and I am in love with that skirt. You look amazing as usual. That lipstick color is so fun! Love your whole look! Perfect pop of color with your lips! I love this outfit! It looks like it is straight out of Paris! I've never heard of Rocksbox but I really think I might have to check it out! gorgeous look! love the lip color and sunnies! 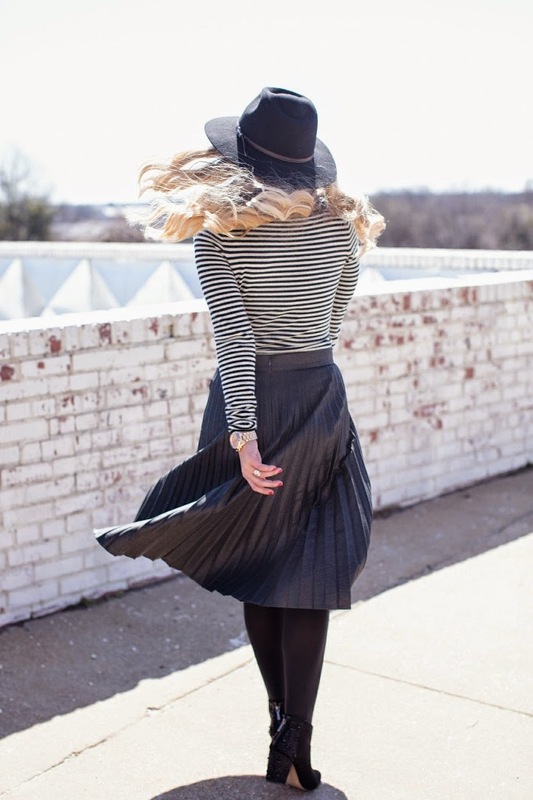 I love this whole outfit, especially that pleated skirt! Casual and chic, well done!